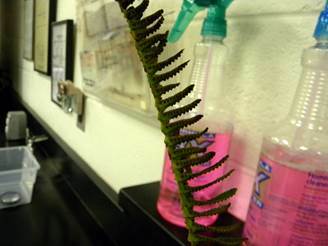 How can the examination of a fern help understand the anatomy and physiology of Tracheophyta? A fern is any one of a group of about 20,000 species of plants classified in the phylum or division Pteridophyta, also known as Filicophyta. The group is also referred to as Polypodiophyta, or Polypodiopsida when treated as a subdivision of tracheophyta (vascular plants). The term "pteridophyte" has traditionally been used to describe all seedless vascular plants, making it synonymous with "ferns and fern allies". This can be confusing since members of the fern phylum Pteridophyta are also sometimes referred to as pteridophytes. The study of ferns and other pteridophytes is called pteridology, and one who studies ferns and other pteridophytes is called a pteridologist.The hypothesis is if one were to examine a fern’s fronds, then a better understanding of fern anatomy and reproduction will become more evident. Most of the body of the fern is made up of leaves. The leaves arise directly from the "horizontal" rhizome. Each leaf is called a frond. The leaf consists of (1) a blade that is pinnatedly subdivided into smaller parts, called pinnae (singular: pinna); and (2) a petiole, a stalk that attaches the blade to the rhizome. The leaf contains veins; thus, providing proof that the plant contains vascular tissue (xylem and phloem). Adventitious roots grow from the rhizome at maturity. 1. Remove a mature “frond” from a fern that does not contain any little dots on the bottom part of the leaf (if any are available; if not, any “frond” will do). 2. Examine the frond from both sides with a magnifying glass. 1. What evidence shows that this plant is a tracheophyte? 2. What evidence shows that this plant carries on photosynthesis? 3. How many pinnae are present of your frond? 4. Is the frond the same thing as a leaf blade? 3. 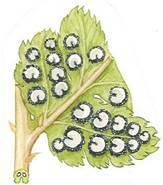 Remove a mature “pinna” from a fern containing little dots called sori on the light green bottom side. 4. Examine the pinna and a sorus with a compound scope (no cover slip or water is necessary; just the slide) with the dots facing upward and only on lower power. 5. The round structures that you should be seeing on each sorus is called a sporangia. 5. How many sori do you have underneath the pinna? 6. Describe what a sorus looks like (ie. the color, shapes, size, etc...)? Sori are clusters of sporangia which contain spores. Sori are not always present at all times of the year. They also change in color and surface texture as they mature. They could also be mistaken for bugs. In some genera the sori are protected by an epidermal flap of tissue, called the indusium. The shape of this flap of tissue differs in different genera. They are typically under the leaves for protection against the elements. 7. Would you conclude that your specimen has sori? 8. What structures make-up a sorus? 9. A sporangium contains haploid what? 10. Why would the sori be found under the pinna? 11. 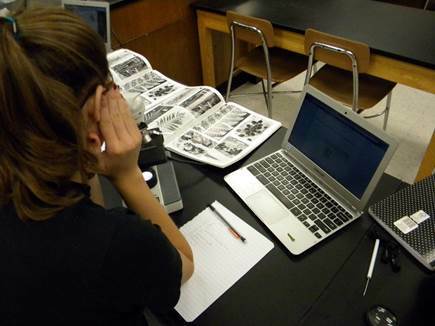 What evidence is showing that your plant is in a sporophyte stage? 6. Using a dissecting needle, scrape 2 or 3 sori onto a slide and then add a drop of water; scraping the sori will actually help break the sporangia away from each other. 7. Cover with a cover glass and examine under the microscope at low-medium power. 8. Look for golden-brown colored spheres. These are sporangia. 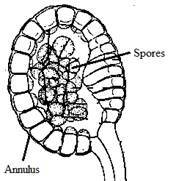 The cells of the sporangia are large and transparent with an odd looking rope like ring (annulus) around them, you might be able to see the spores within or in some cases (see diagram); they may have already split open to release the spores. 12. What specifically are the spore producing structures for a fern called? 13. How would you best describe if a sporangium is already opened or damaged? 14. What is the rope-like outer structure/membrane of a sporangium called? 15. What part of the plant (rhizome, pinna, or sorus) are sporangia specifically found in or on? 2. Scrape 3 or 4 sori from another pinna onto the slide and place it under the microscope. 3. Locate a sporangium (or it can be a few) and confirm that the sporangium is not opened or damaged. It’s best that the sporangium be away from any debris. 4. Obtain a dropper full of ethyl alcohol from the stock table. 5. While watching the up coming event under the microscope, add 1-2 drops of ethyl alcohol to the sporangium (sporangia if more than one). Observe what happens to a sporangium casing after only a few seconds. 10. Please clean up all materials as directed. Write a proper conclusion paragraph by “restating” the problem question and hypothesis below and then answer the remaining questions (see bullets below). 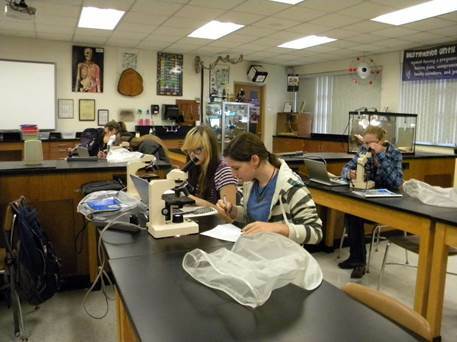 You may need to review the beginning of the lab; such as, the background information paragraph. When you are done, you should have “one” indented paragraph summarizing the activity. Do not include the word “it” anywhere in the paragraph. Do not have fragmented sentences in the paragraph. - ie Start off by writing… The problem question was that …. Was the hypothesis proven or disproven? If disproven only, tell why?